C Chase Roullier vs. DIs Damon Harrison & Dalvin Tomlinson – The sixth-round rookie has had a promising first season, especially in pass-protection, where he’s allowed just six total pressures on his 249 pass-rushing snaps for a pass-blocking efficiency of 98.2, the 12th-best mark among centers. However, Roullier’s biggest challenge this week won’t come in pass-protection, it will be in run blocking. In eight games this year, Roullier has managed a ‘below average’ run-blocking grade of just 60.7, which ranks 17th of 35 players at the position and he’ll need to pull out his best possible performance if he’s to make impact against Harrison and Tomlinson, who currently rank first and 18th among 125 interior defensive linemen with run-defense grades of 94.5 and 86.0, respectively. QB Kirk Cousins vs. Giants’ pass-rush – This week’s contest could possibly be the most important game of Cousins’ career and, unbelievably, it could also be his last game as the quarterback of the Washington Redskins. Cousins now has one last chance to show that he’s worthy of being a franchise signal caller, and there will be no better way to showcase his talent than by performing well against the pressure that will be coming from edge-rushers Olivier Vernon and Jason Pierre-Paul. Through 16 weeks, Cousins has shown that he has the ability to perform under duress and has posted a passer rating of 76.7 on throws under pressure, which is good for ninth among the league’s starting quarterbacks. He’ll need to maintain this high standard against Vernon and Pierre-Paul, who will be trying to take a few zeros off his offseason paycheck. Through 16 weeks, Pierre-Paul has racked up 51 total pressures and Vernon has produced 34 pressures, which are the 16th and 26th most among 66 4-3 defensive ends, respectively. WR Ryan Grant vs. CB Ross Cockrell – Through 15 games, the fourth-year impending free agent has arguably been the team’s most consistent wide receiver and has certainly put enough on tape to warrant a serious look from teams this off-season. 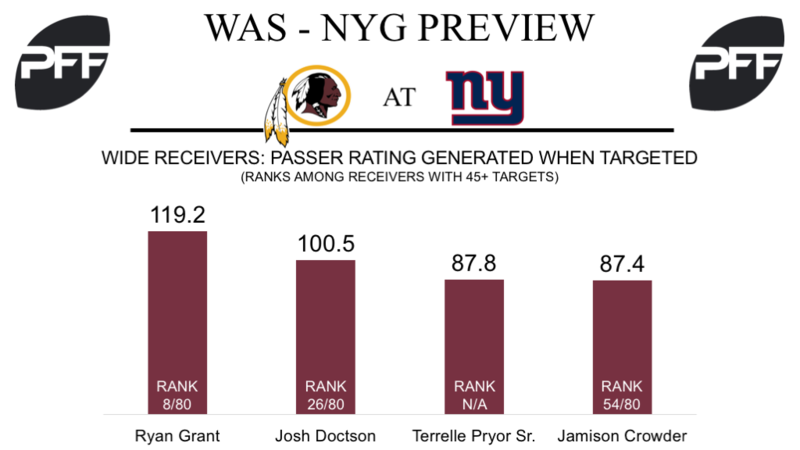 This year, Grant has caught 43 of 46 catchable targets and has generated a passer rating of 119.2, the eighth-best mark among receivers and easily the best mark among Redskins pass catchers. As he enters the final game of the season, he’ll be looking to get the better of cornerback Ross Cockrell, who is coming off an extremely impressive Week 16 performance, where he allowed one catch from three targets, added two interceptions and ended the game with an overall grade of 88.7, the third-best grade among cornerbacks in Week 16. TE Evan Engram vs. LB Zach Vigil – Engram is one of only four tight ends this season to eclipse 100 targets. His 108 targets are the second-most at the tight end position, while his 75 catchable targets are the fourth-most. Though the volume and production have been there, it hasn’t always been pretty, as Engram’s 11 drops are four more than any other tight end. His drop rate of 14.67 is the third-highest rate among 36 qualifying tight ends. Zach Vigil has made the most of his recent opportunities and is currently tied for 21st among 92 qualifying linebackers with an overall grade of 80.5. He’s been targeted 20 times this season, allowing 14 receptions for 105 yards. Vigil’s 0.74 yards per coverage snap ranks sixth among 82 qualifying linebackers. 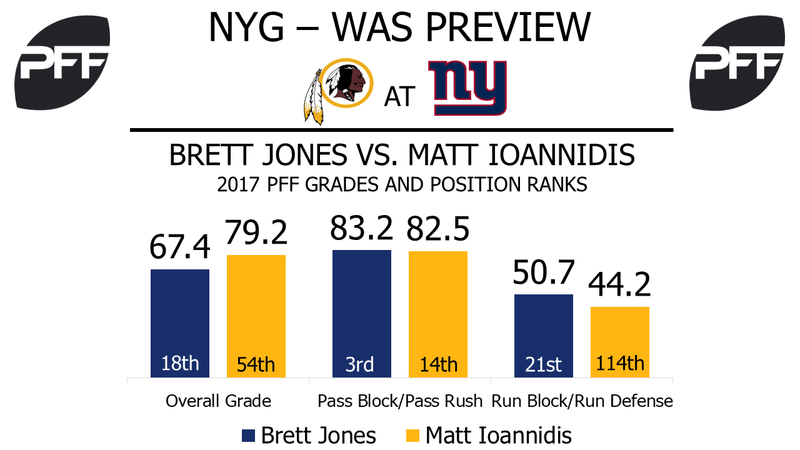 C Brett Jones vs. Dl Matt Ioannidis – Brett Jones has excelled in pass protection, as his pass-blocking grade of 83.2 ranks second among centers. He’s allowed eight pressures on 458 pass-block snaps, giving him with a pass-blocking efficiency of 98.6. Where Jones has struggled has been in the run game, where his run-blocking grade of 50.7 ranks 21st among centers. He should see a mixture of interior defenders on Sunday, including Matt Ioannidis, whose pass-rush grade of 82.5 ranks 14th among 106 qualifying interior defenders.